The story in two sentence: A teenage girl doubts her father’s theory of tiny and advanced people living in the woods. Soon she finds herself transported into the world she didn’t believe in. Storyline: After losing her mother Mary-Kathrin (Amanada Seyfried), a stubborn teenage girl, has to live with her father, who became obsessed with the idea that there is a different species living in the woods that is more advanced than the regular humans and can therefore move faster without even being noticed. Influened by her mother’s perception of the father’s insanity, she doesn’t believe in his theory at all and tries to run away. But instead of getting away she ends up not only in that world that she doubted so much but also in a war between good and evil. Will she ever see her father again? Review Epic is a very fast-paced adventure which doesn’t waste much time to introduce the audience to the characters and I actually had difficulties following the story at first. But after the last confusions have been resolved I enjoyed the action and storyline a lot. It was planned out into the smallest detail. I started wondering, “What if there are actually tiny creature out there that move so fast that we can’t even spot them? After all we lost most of our natural instincts.” The voices were chosen wisely; Amanda Seyfried is just perfect for magical movies, and I was surprised how mature Josh Hucherson sounded. The only character I wasn’t so sure about was Princess Tara; I like Beyoncé Knowles and I even enjoyed her acting performance in Obsession – not neccessarily because she can act, the role just seemed to fit her, and I like “Mrs. Carter” – but I would have rather heard someone like Gabrielle Union speaking for the princess. Beyoncé Knowles didn’t feel right for this one. But it didn’t hurt the movie flow. 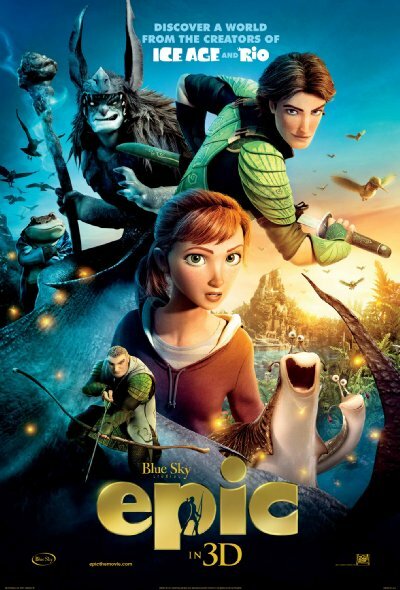 Epic is a movie that carries the message that our earth is in danger and we need to keep our forests alive. It also teaches, like so many movies, that sticking together is the best way to fight against something. Believe in yourself and everything can be possible. There is definitely a lot to see and kids (and adults) will have a good time watching it. However, we don’t see any new special effects or impressive graphics, so I don’t think I would pay extra to see it in 3-D.